On Monday August 18, local journalist and ultrarunner, Mike Sandrock, came out to run with us on our Manic Monday group run up Green Mountain. He had this to say about his experience and our club in his article posted on Boulder’s Daily Camera. Ernest Greenman might not be too surprised if he were around to see several dozen lean runners ascending the mountain that now bears part of his name just west of Chautauqua on a recent Monday evening. After all, Greenman, who moved to Boulder in the 1890s and did trail work on the mountain, had the same love of trails and nature as these Rocky Mountain Runners taking their weekly group run. The club is the newest running group in Boulder, sprouting from the friendship of a group of local ultra runners and modeled after the British club system, with a goal of keeping it fun and free. While it is positioned as a trail and ultrarunning club, everyone is welcome, I discovered when I showed up for the weekly Green Mountain run. “Running can be an individualistic sport, yet we can still feel part of a group,” Scottish native Ryan Smith said, waiting patiently for me as we climbed up Gregory Canyon. It was cool after a hot day, and as the faster runners disappeared up the single-track trail, another of the original founding friends, Mike Randall, paused to go my pace on his way up. Canaday, one of the new stars of mountain running, won the Pikes Peak Ascent two days earlier. A top female ultra runner, Cassie Scallon, is also a group member. Before long, another fast guy, Trent Briney, a 2:12 marathoner and fourth-place finisher at the 2004 Olympic Trials, passed me. He had gotten a late start after finishing work as manager of the Boulder Running Co., where another of the founders, Ryan Lassen, works. Smith and his wife, Silke Koester, along with Lassen, “are really the heart and soul” of the Rocky Mountain Runners, said Randall. All three were preparing to head to Europe to race the Trans-Alps, an eight-day, 200-mile stage race. It turns out that traveling and socializing together is a big part of the club. 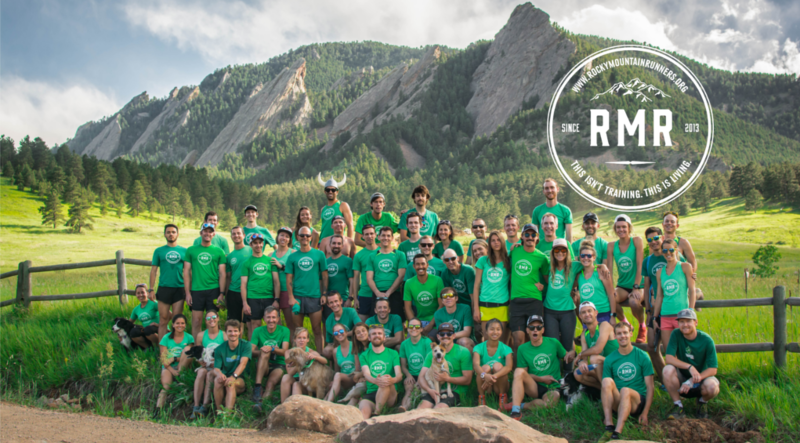 There are other weekly group runs, as well as beer socials at Under the Sun and Sanitas Brewing. On Thursdays, the club meets at the Fior di Latte gelato shop on Pearl Street before running to the Mount Sanitas valley trail for a tough hill workout — followed by gelato back at Fior’s. Indeed, as I picked my way down Gregory Canyon and through the Chautauqua meadow, leaving the others to run to the top of Green, scores of people were walking, running, cycling and simply enjoying the beautiful summer evening. The trails teemed with runners; all of Boulder seemed to be out exercising. In the early days, it was world-class runners like Frank Shorter and iconoclasts like the late ultra runner Micah True who used these trails; now, it is much of the community. Wouldn’t Mr. Greenman be proud?